Its a new month cant believe it.. Its April already 2017 is on a zoom! This month we are trying to eat healthier so coming up with more soups and salads @ secondrecipe. We take our health for granted and food goes a long way in maintaining good health.Salads are a great way of adding raw veggies and fruits to your diet.Many people feel salad is boring and cannot fill the stomach,but on the contrary they can be tasty and healthy at the same time.Just the right amount of crunch and dressing can take your salad to the next level.Here is a simple recipe which needs Zero cooking, and yet is wholesome food.I like low oil/fat lemon olive oil vinaigrette as it is low calorie unlike mayo and white sauce dressing. Salad consumption with such dressings will be great for your waistline as well as for your budget.Note: All fruits and veggies should be washed properly before consuming this fresh salad.If you love your cheese,add a small slice of feta or haloumi or for a vegan option,add some silky tofu and take it to the next level. 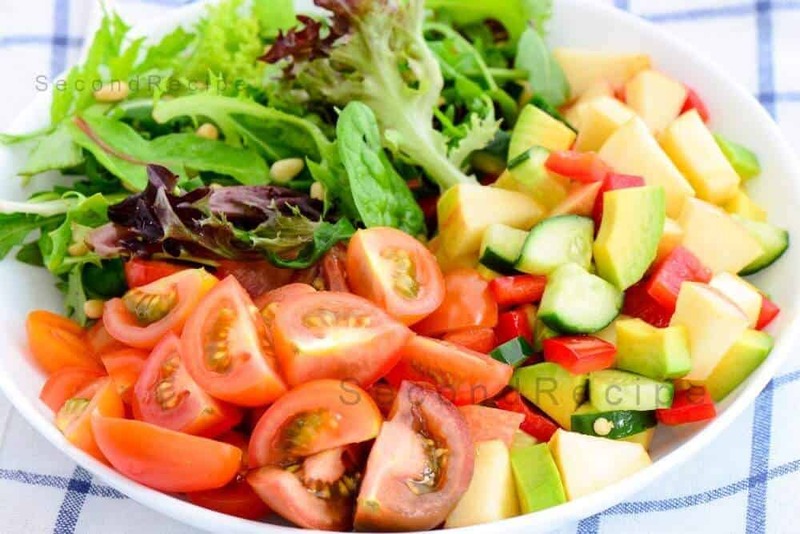 What makes this fresh salad recipe better? Add any nuts or cheese according to your taste. Low oil dressing in fresh salad means low calories yet a great tangy taste. If you do not have pine nuts,add walnuts. Wash Cut all the fruits and mix well. Add the dressing to the cut fruit and mix well.